The Carnegie Medal is awarded annually to the writer of an outstanding book for young people. 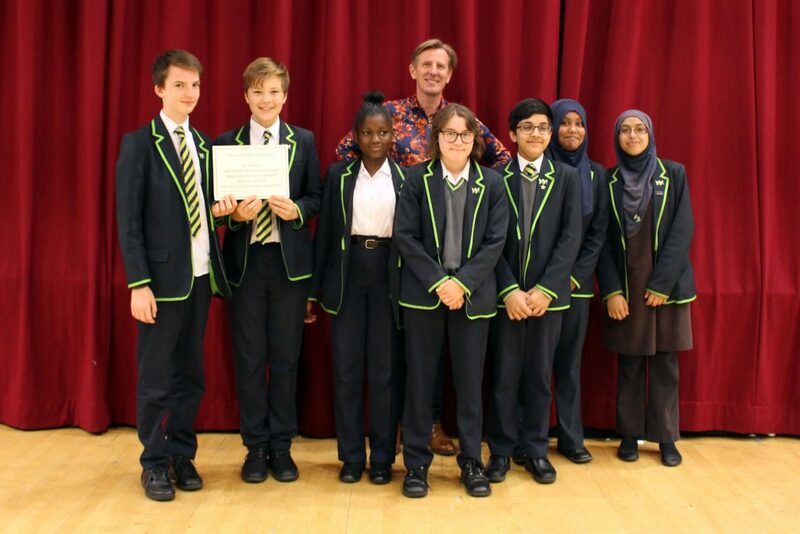 Hackney Learning Trust hold a Carnegie shadowing competition every year inviting schools in the borough to use drama, dance, music and moving image to create their own response to one of the novels shortlisted. It’s an excellent opportunity for students to meet an author, read new novels and talk about literature. This year, successful author Phillip Reeve judged the pieces. Haggerston School students used drama to explore their thoughts and feelings on Ruta Sepety’s ‘Salt to the Sea’ and won! Sepety’s novel was also victorious in winning the Carnegie Medal. Students pictured from left to right: Stanley Carrick, Louis Allen-Sinclair, Dorcas Oluwademilade, Kate Elliot, Mohammed Ahmed, Areefa Khan, Fatima Altaf.